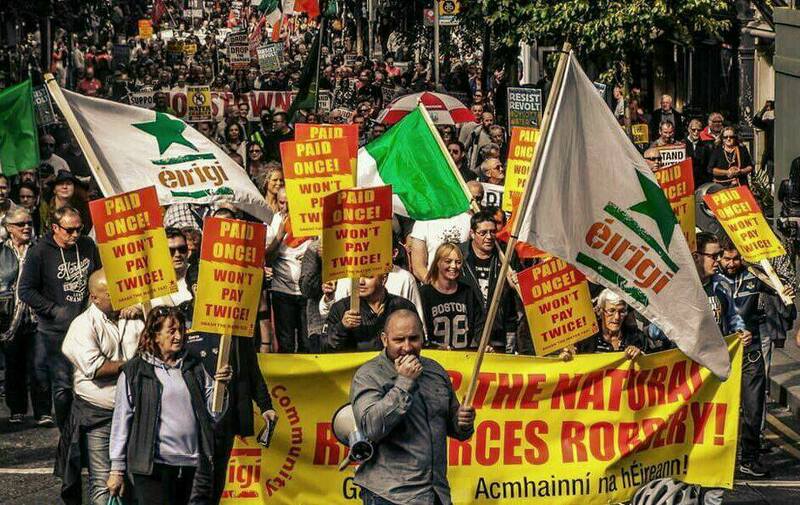 In the 2016 election, these anti-working class scumbags, who had been involved in imposing vicious austerity on the working class in the south, lost most of their seats in the Dublin parliament. The latest Sunday Times Behaviour and Attitudes poll, published yesterday, show Labour is continuing to decline. Among the poorest 50% of people in the south, their support level is 2%, a mere one-tenth of the support for Sinn Fein and also smaller than the support for the Trotskyist bloc in the Dublin parliament. 34% of the poorer half of the population indicated they would vote for SF, the Trotskyists and independent leftists. Yesterday’s Sunday Independent published findings from the Kantar Millward Brown poll, showing total support for Labour at just 4 percent. Not satisfied with the blow given to them by the Irish public, ‘Irish Water’ are again pushing for the commodification of Ireland’s water resources. This time they are doing it under the ruse of needing an extra two billion euro of tax-payers’ money to guarantee the greater Dublin areas water supply, by building a 170-kilometre pipeline to bring 330 million litres per day from the River Shannon to the area. This is all very convenient coming a few days after the announcement that Irish Water have plans in place to introduce excess water charges from next year. Today, February 4 (2018) marks the 150th anniversary of the birth of Constance Gore-Booth/Constance de Markievicz. To commemorate the anniversary, I’m putting up the text of her 1923 pamphlet What Irish Republicans Stand For. I have had a copy of this pamphlet since the late 1980s – ie for about 30 years! – dating back to when I first began collecting her writings, many of which appear on this blog. I drew on her writings for my MA thesis which was written in 1995 and the first few months of 1996 – the thesis chapters also appear on this blog. Ever since I started this blog in 2011, I have meant to stick it up here, but wanted to coincide it going up with some anniversary relating to her. I had intended, finally, to put it up on July 15, last year, the 90th anniversary of her death, but got caught up in other things and the day came and went. However, the 150th anniversary of her birth seems an even better time. So, finally here it is. Nick Scullin typed up half of it from a photocopy of the original pamphlet; I typed up the other half. At first, I thought it was published in 1924 but it appears that it is 1923. I don’t have access to libraries with copies of daily papers from that time so haven’t been able to double-check – Markievicz, for instance, cites several newspaper articles, giving the day of the month, so these could be looked up to verify 1923 is the year and not 1924. The original includes the words, “Reprinted from Forward by courtesy of the Editor”. This was a left-wing Scottish newspaper, based in Glasgow. Revolutionary socialists such as James Connolly and John Maclean, plus others associated with ‘Red Clydeside’ wrote for it, as did a range of reformist socialists. After WW1, the paper was particularly associated with the ILP (left social-democrats). Although Forward had its own printing and publishing company, What Irish Republicans Stand For was printed by Civic Press Ltd of Howard Street in Glasgow. We typed it up in line with the original pamphlet – ie where it used italics, bold, capitals etc, we left them in place and where headings were centred in the original, we left them centred. I have, however, put in gaps between paragraphs where the original simply indented a few spaces to indicate new paragraphs. I’ve not corrected mistakes – eg Eamonn de Valera did not draw up the Democratic Programme (he, like Markievicz, was in prison in England at the time). Also, some of the language now seems quaint. Co-operative Commonwealth, for instance, was often used as a synonym for socialism. There was also the view that pre-Conquest Gaelic society was a pre-class society, so references to “Gaelic ideas” often referred to this; regardless of the exact nature of Gaelic society, certainly both feudalism and capitalism were imposed on Ireland from across the water. It is also important to keep in mind the time in which this was written. 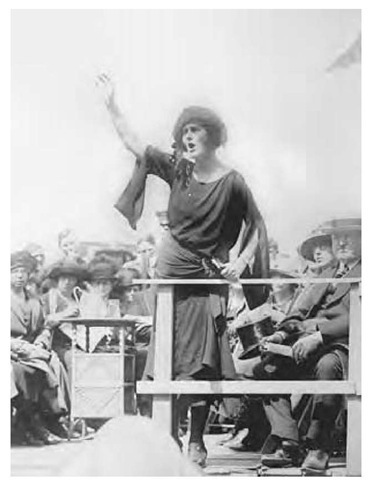 A counter-revolution was taking place, reactionary elements within the independence movement were gaining control and imprisoning and murdering their former comrades, including people Markievicz had worked with. 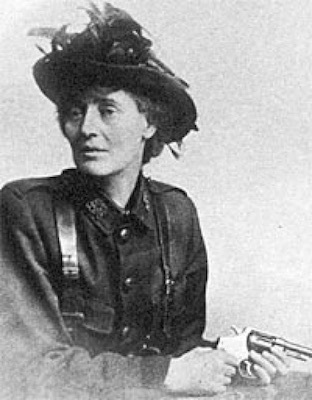 Although Markievicz staunchly opposed the Free State, the counter-revolution took a heavy toll on her and she died just four years after the end of the civil war. The cover has a box with the following in it, just below the title and by-line. NB: the misspelling of Wolfe, Mitchel and Lalor are as on the cover. I offer this little leaflet humbly to the memory of Wolf Tone, of Mitchell, of Lawler, and of James Connolly to whom I am indebted for the faith and the knowledge that inspired it. In these articles I am going to discuss Ireland and the “Irish Free State” from an economic point of view, and endeavour to show that this “Free State” is but a further attempt to force the English social and economic systems on a people who cling instinctively and with a passionate loyalty to the ideals of a better civilisation, the tradition of which is part of their subconscious spiritual and mental selves. It was devised by the British Cabinet of imperialists and capitalists and accepted by their would-be counterparts in Ireland, whom they supply with money, arms, and men for the purpose of breaking up the growing movement towards the development of the Co-operative Commonwealth in Ireland. I claim that for this reason the Free State can never be acceptable to the people of Ireland, and, moreover, that this is the key that opens the door to a thorough understanding of the Irish question, and that there is no other key. For 800 years Ireland has been devastated again and again by English armies and tricked by English politicians for but one object – the destruction of the Gaelic State to its last traditions and relics, and the establishment, in its place, of the feudal-capitalist state. The military and political conquests were but means to this end, whole clans were massacred, dispersed or starved to death, whole provinces laid waste again and again for this one purpose – the forcing of an alien and repugnant civilisation on a civilised people. It is only in latter years that the history of Ireland has been approached in a scientific manner, and that this has been made clear. Mrs Alice Stopford Green is the great pioneer in this work. For many years she has been digging laboriously into the past and bringing to light all that she has gleaned from the old documents that survive the systematic destruction of the records of Ireland’s greatness by the English. James Connolly went further. A student of labour, viewed as a world question, from both scientific and historical sources, a man of practical experience as an organiser, agitator, and speaker in two continents, he mated his knowledge and experience with the facts disclosed by Mrs Green, George O’Brien and others, and has left us in his books a wonderfully comprehensive sketch of Ireland’s real struggle. Her past sufferings, her present slow awakening and struggle and her future hopes and aspirations. 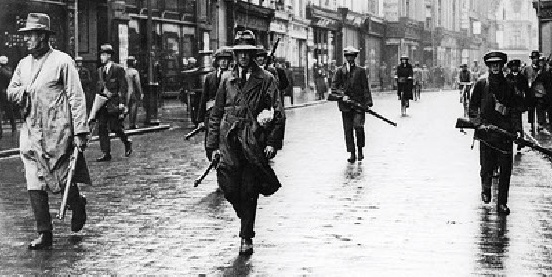 The Irish Civil War of 1922–23 is one of the most neglected events in Irish history. In contrast to the Tan War of 1919–21, a celebrated event about which a great deal has been written, very little attention has been paid to a conflict that not only exacted a heavier toll in terms of casualties, but was also more significant in shaping subsequent political divisions within the southern state itself. Ken Loach’s acclaimed film The Wind That Shakes the Barley is perhaps the first film to look in any detail at the nature of the divides that existed within the Irish independence movement, and the manner in which these worsened after the signing of the December 1921 Treaty. Leaving aside the predictable hostility from the armchair imperialists of the English Tory press, most serious critical comment concerning the film has been positive and has recognised the importance of opening up a debate on this important period in modern Irish history. It is as a contribution in this direction that this article on the experience of communists in the Irish civil war is intended.